The New Orleans City Council could be going down the path of white-washing history and uber political correctness. Due to the outrage of the Confederate flag suddenly across the country, New Orleans officials are apparently reviewing all of the historical confederate monuments and symbolism throughout the city. In talks is the Robert E. Lee statue at the center of “Lee Circle” in the Central Business District and the statue of Confederate Gen. P.G.T. Beauregard at the heart of City Park. The local New Orleans NAACP leader, Morris Reed, said both monuments were basically offensive and glorified leaders who were involved in fighting for slavery. However, at what point does New Orleans begin to entirely white-wash history? And where will that white-washing stop? Lee and Beauregard are memorialized because they are a piece of Southern history, whether Landrieu and the City Council like it or not. The fact is that the Confederacy did exist and these men were Americans who put their lives on the line to fight for their home states and their rights to govern themselves. Lee and Beauregard were ultimately defeated, but that should not be taken as an opportunity to deny their existence. If the city is going to get rid of their statues, why not get rid of President Andrew Jackson’s memorial in the French Quarter? After all, some historians say he was a racist. There’s a problem when these historical figures are taken out of their historical context. These American leaders were all living in a time period where language, policies and judgement was consumed by racism. But, does this make them deplorable individuals for being a part of that time period? 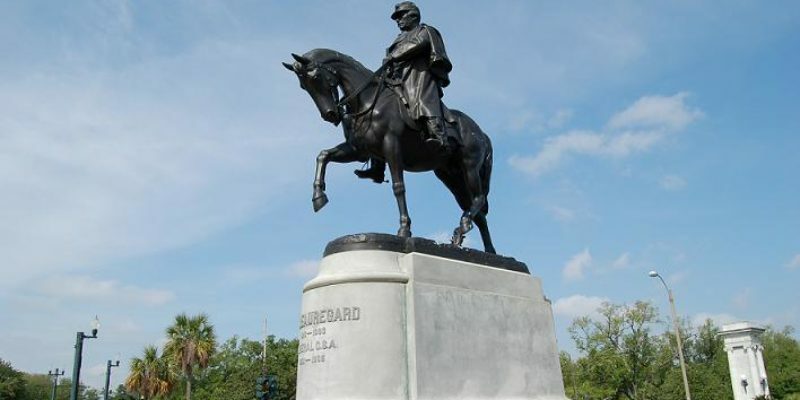 And if Lee Circle is diminished and Beauregard’s City Park statue is taken down, what is next to go in New Orleans? Should Christians begin to demand that the gay flag that flies throughout parts of the city be removed because it represents to some biases and hatred toward Christians? Or will gays begin to demand that street names named after Catholic saints be renamed because they represent a church that some believe outcasts them? Should Landrieu and the other Democrats running the city rebuke their political party since the Democratic Party had close ties to the Ku Klux Klan back in the day? This is the slippery-slope that the Left constantly gets itself into because they strive so hard to be overtly politically correct instead of accepting reality, logic and history. We’ve already seen this kind of white-washing of history in schools, where students are not allowed to read books that have what today would be called racial slurs or homophobic slurs, but back then was simply language. To defend these historical monuments is not to defend the causes of the Confederacy, but rather a history that existed and a time period where America was in the middle of a Civil War. It will be a sad day in New Orleans when those in power decide to denigrate the history of that city solely for the purpose of not offending someone’s views.